When we woke up this morning the world was white. And it's still snowing. That very fine stuff we're seeing today can fool a person -- it doesn't look like much but when it carries on all day, well then, you've got A Snow Day. I took these pics this morning with my iPhone and, as you can see, I had some creative fun (between cleaning the bathrooms) playing on PicMonkey. Now, if I was pressed to choose my favourite of this set, I think I'd pick #2. It's a great day for playing inside. I'm grateful for my warm house today. And for books, creative handwork, and sharing a bowl of hot soup with my sweetie pie (today it's potato sour cream soup with green onion). 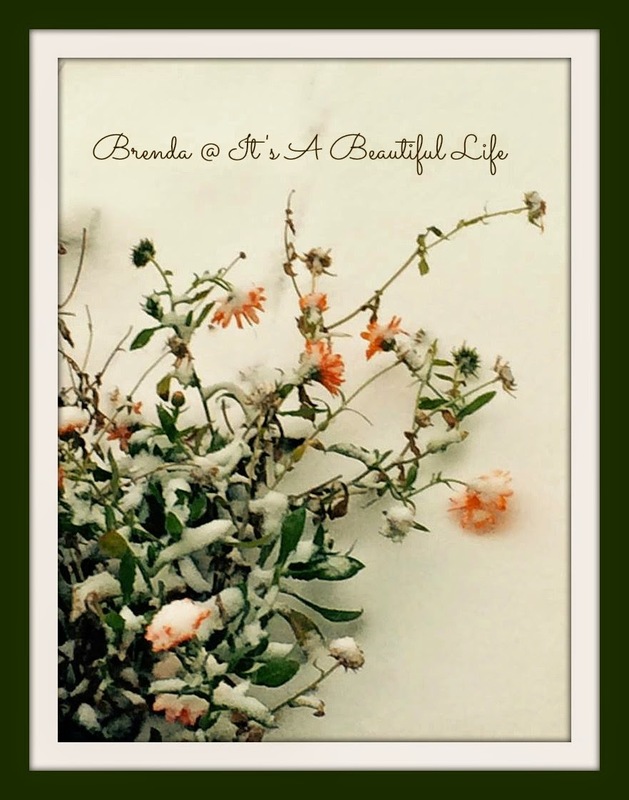 Beautiful photos Brenda! That soup sounds good too! It's still snowing... softly. The soup is about ready to eat. Yum. A recipe that is based on one my mom made years ago when I was growing up. At first glance, I thought these were postcards! I agree, the second one is my favorite. Oh Christine, I love that quote by J.B. Priestley. I shall keep that near by too. 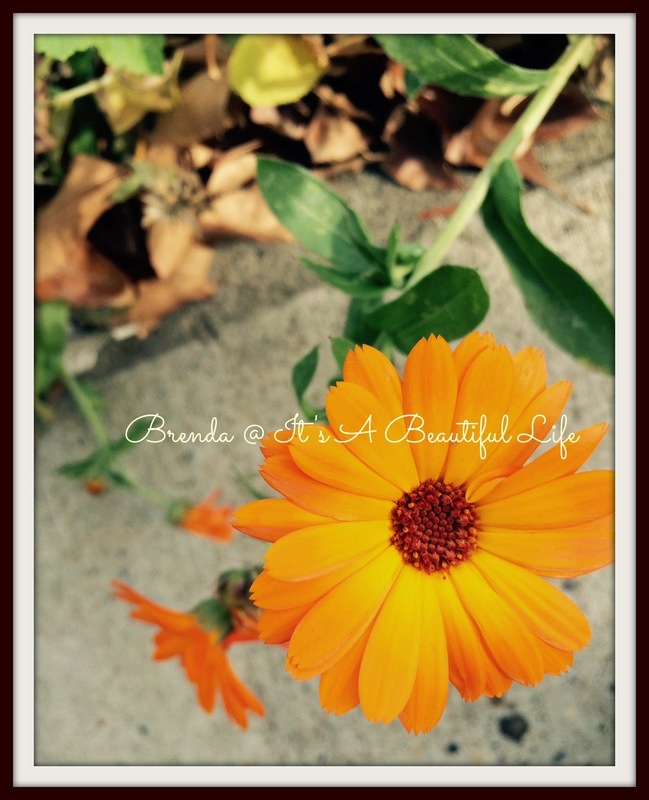 Brenda, how fun to capture the flower in a sort of before and after. 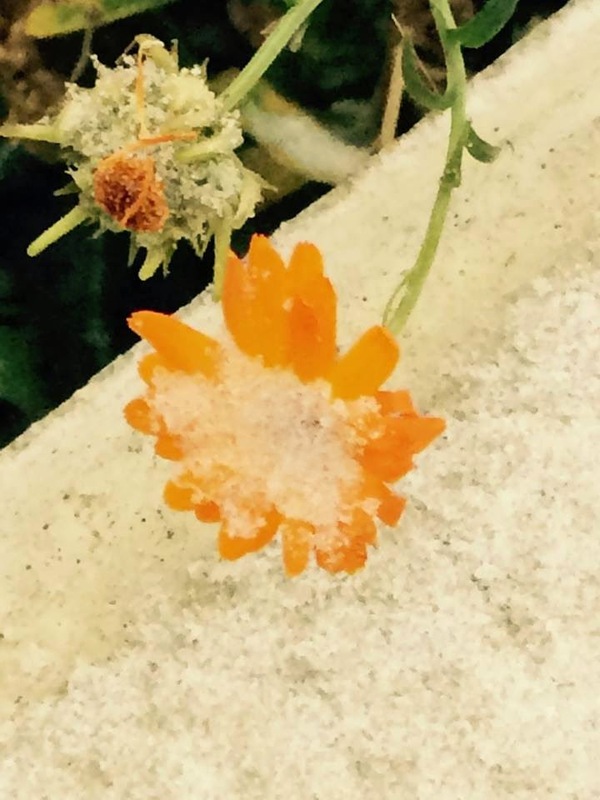 I'm leaning toward #3 as it shows the weight of the snow on the flower. Thanks! Oh dear, I was old some years ago. Glad that you were enchanted enough by the snow to take some lovely photos...my favorite is the third one! Beautiful!!! I love every photo as much as every other one! And your "framing" really sets them off. Love the quote from Lady Bird Johnson. I can get tired of snow and its effects after months and months of it, but the first snowfall of the year is always magical to me. So I guess there's hope for me yet :)! Hi Susan, I'm in Alberta, Canada. We've had a lovely autumn but I have a feeling the snow will stay now. We always think we're blessed when we don't get winter staying as early as October. It does make for a long winter then. 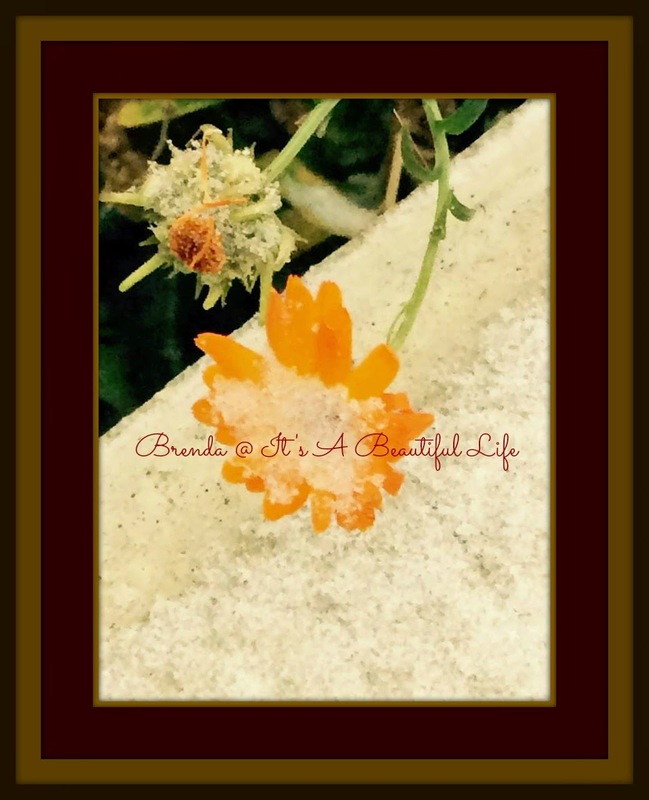 I love your before & after pictures of the marigold. Snow already ! I love to see it, but not to live with it. When it snow where I live in rural France, we are not able to get out, as the local snow plough (LOL ) is the commune tractor with a man walking behind scattering a little salt. Stay warm & enjoy your homemade soup. Beautiful snow - the first snow is magical, transforming the world as you've illustrated so well. I hope you enjoyed your cozy day at home. Have a great Sunday, Brenda. How quickly the world can change, yes? I am glad it is cozy and delicious in your inside world! So beautiful Brenda! We have snow here as well and it is very pretty! Yesterday the snowflakes were huge..breath taking! I love your photos...just lovely! The soup and company of your sweetheart sounds delightful. I love cozy days at home..enjoy! What a difference twenty four hours can make! You shared it well, as always. I think the potato soup sounds like the perfect way to celebrate the first snow of the season. Lovely pictures!